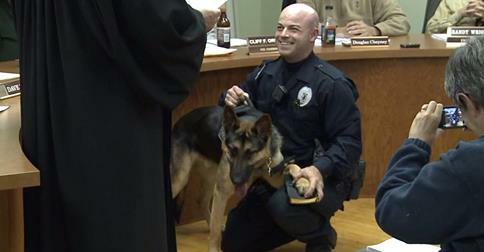 Patrolman Nicholas Ague and K-9 Rex went into service in December 2014. K-9 REX GETS "SWORN IN"
Our K-9 Program got off to an unusual start. PTL Ague had the passion for a four legged companion on patrol, but his goal seemed years away. Then one afternoon in August 2013, PTL Ague did what he usually does, he helped an animal in distress. A bystander happened to capture his photo as he was carrying an injured dog through a field. The Police Department posted the photo to Facebook and received a huge response. The story was then picked up by local media and went 'viral' on the web. The story ended up getting carried (literally) all over the world, including an article in the "Daily Mail" in the UK and a Sunday morning appearance on "Fox and Friends". Donations toward our K-9 program came in quickly, and the rest is history. Since Nick and K-9 Rex have teamed up, the two have been responsible for many drug arrests; getting tens of thousands of dollars in narcotics off of the streets; and have served to apprehend fleeing or uncooperative suspects after the person surrendered to the dog, avoiding potential injuries to citizens, officers, and the suspect. The original photo and Facebook story are posted below. On Sunday, August 11, 2013, South Londonderry Patrolman Nick Ague went the extra mile to make sure a dog made it back home. Two dogs had run from a vehicle after it was involved in a crash on the east side of Palmyra. One was captured. The other, a German Shepherd, made it across town and past South Lingle Avenue. Eventually the dog made it to the area of the Lebanon-Dauphin County line where it was found. The dog was not willing to walk at this point, having suffered injuries to the pads on its paws. The injuries were presumably from the lengthy run on the asphalt and other terrain. Facing no other good options, Patrolman Ague carried the dog a long way back to the owner's vehicle. Our Department salutes his efforts.